Designer Eileen Hull is coming to Sir Stampalot - YAY!! 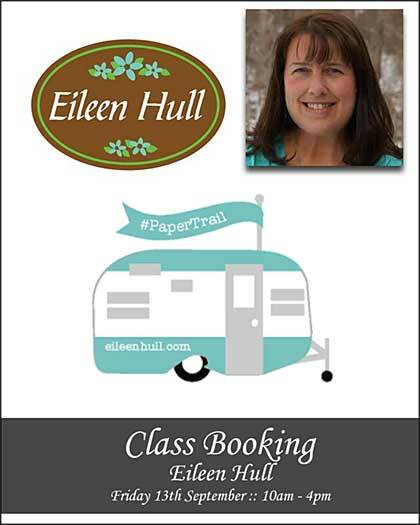 Eileen will be running a class here at Sir Stampalot on Friday 13th September as part of her 'UK Paper Trail Tour 2019'. This will be Eileen's first teaching trip to the UK, so you don't want to miss out on this opportunity. Although Eileen is still working on the amazing project for us, as soon as we are given any sneak peeks or more, we will share all the details with you on Facebook or email you if you have already booked. So with this in mind, you can either book your space on the workshop in full, or pay a deposit for now and the rest by July 1st. The full cost of the workshop is £85.00 which includes supplies, hot/cold drinks and nibbles. You can either pay in full or we are taking deposits of £42.50 to secure your place, with the remainder payment of £42.50 being due on 1st July (we will contact you when the final payment is due). The workshop with Eileen will take place here at the Sir Stampalot HQ in Peterborough on 13th Sept and will run from 10am - 4pm. The project will feature Eileen's fabulous Sizzix dies amongst other brands that she designs and promotes for. Any questions please do not hesitate to telephone me on 01733 324 007 or email me janice@sirstampalot.co.uk.